Anti-wrinkle & firming eye cream with encapsulated Pro-Retinyl A plus Pro-Lastyl. Advanced RevitaLift smoothes wrinkles and firms skin as it remodels skin’s surface from within. 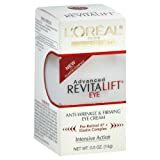 Advanced RevitaLift Eye is created specially to care for the delicate area around the eyes, to fight wrinkles, firm skin, and reduce the morning puffy look. Innovation – Advanced Anti-Wrinkle & Firming Technology: Experience advanced action against the signs of aging. Advanced RevitaLift with powerful ingredients, Pro-Retinyl A, Pro-Lastyl, and Criste Marine Extract, increase cell turnover, reduces wrinkles, firms skin and provides 24-hour moisturization. Multi-Action Benefits. 1. Advanced Anti-Wrinkle Action: Encapsulated Pro-Retinyl A plus Criste Marine Extract accelerate skin renewal to reduce the number and length of lines and surface wrinkles. Now, see results in just two weeks. Encapsulated technology provides continuous action to help fight the signs of aging. Minimizes the appearance of dark circles and puffiness. 2. Powerful Firming Innovation: Patented Pro-Lastyl is shown to renew elastin fibers. Remodels skin’s natural surface matrix. Skin is measurably more resilient and toned. 3. Continuous Hydration: Provides 24-hour hydration and soothes dryness. Increases cell turnover for visibly radiant and revitalized skin. Formula Essentials: Fragrance free; Ophthalmologist tested; Dermatologist tested for gentleness; Safe for contact lens wearers; Non-greasy.